Fitness + Enrichment + Recreation... Simply the best! The Connection is committed to providing opportunities for everyone. In addition to our own programs, we work in partnership with Our House, Inc to provide a variety of programs for adults with special needs. 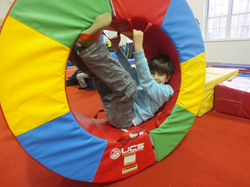 Drop in play time in our big gym. Child must be accompanied by an adult. Space is limited, passes are available at the Front Desk. You do not need to be a Connection member. Available one Sunday per month from 2:30-3:30 pm. Contact christina.piccirillo@theconnectiononline.org for more information. Co-sponsored with Special Olympics New Jersey, this program emphasizes sports skill development in physical activity and play. Programs develop the fundamental prerequisite skills to prepare students to be future athletes. Click here for the Special Olympics Registration Form. Our special needs swim lesson (S.N.S.L.) provides 45 minutes of instruction provided by our trained staff and volunteers. This program is designed to teach and improve each student’s swimming skills while working in a group environment to improve their focus, comfort, and overall understanding of safety in the pool. This one hour program provides individuals who are physically or intellectually challenged the opportunity to use the pool for exercise, learn basic swimming skills, be part of a social group, and play games while having fun in a safe aquatic environment. *Medical form must be completed and returned to The Connection one week prior to participation in program. Click Here for Medical Form. Fun stretches and poses designed to engage the body, mind and spirit. Modifications provided as needed. 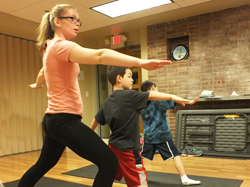 Children are introduced to basic dance techniques through innovative and creative body movement. Individualized modifications to activities will be made as needed. Supervised by a certified trainer, training is based upon input and direction from participants’ therapists. Evaluation and medical clearance necessary. Contact Russell Graham, 908-273-4242 x 113 to schedule an appointment. Teens and young adults meet twice a month for an evening of fun and camaraderie on the following dates: September 14 & 28, October 5 & 19, November 2 & 16, December 7 & 21, January 4 & 18, February 1 & 15, March 15 & 29, April 12 & 26, May 10 & 24, June 7. A special THANK YOU to the Summit Area Public Foundation for their support of our Special Needs Programs. Make a difference! Become a volunteer for our special needs classes. No experience required! Contact Christina Piccirillo at Christina.Piccirillo@theconnectiononline.org or phone: 908-273-4242 ext 131. Copyright © 2019 The Connection. All Rights Reserved. The Connection serves individuals in Union, Morris, and Essex Counties including the communities of Summit, New Providence, Berkeley Heights, Chatham, Maplewood, Short Hills, Springfield, Mountainside and Long Hill Township.